Project context The flat land lies in an area without any surrounding development, close to allotment gardens on the edge of a village. The lot has an oblong shape. House Single-storey, with respect to the environs and to the investor's requirements. It corresponds to the character of the site with its elongated shape, embodying the inner soul - the axial view-through from the entrance hall through the living space and terrace up to the garden. The layout is divided into two sections, of which the lower contains the private parts of the house (bedroom, children's rooms and the main bathroom). At one end, this volume is opened by a parking space, and at the other end it is closed by a do-it-yourself workshop with a view of the grounds. The second section rises from the guest room to the living room. Its height culminates at the dividing line between the outdoor and indoor space. A semi-open terrace is located behind the dividing line. Along its longer side, same as the parking space, it is wrapped in the facade envelope which unifies the whole house and closes it with the required degree of intimacy. The pent roof is designed in harmony with the direction of the locally prevailing north-west winds. Materials Two-by-four system construction. 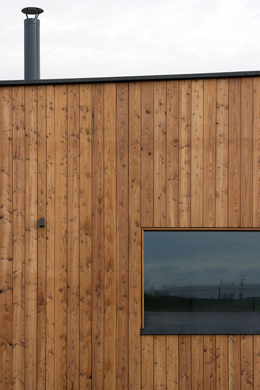 The facade is made of vertically laid planed larch baulks of rhomboidal section.